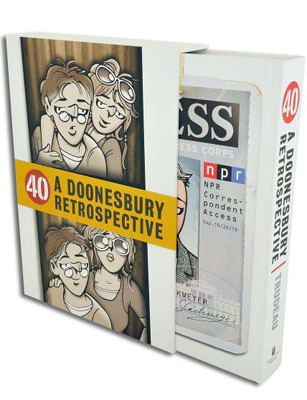 A massive, beautifully produced, very nearly definitive overview of 40 years of Garry Trudeau's unabashedly left-leaning comic strip, which by now amounts to something like a satirical epic of turn-of-the-millennium American life. The collection reprints 1,400 strips, starting with the eponymous Mike Doonesbury meeting his Walden College roommate B.D. and running through his daughter Alex's graduation from MIT, alongside essays by Trudeau about 14 key characters and a dizzying schematic illustrating how the strip's massive cast is connected to each other.